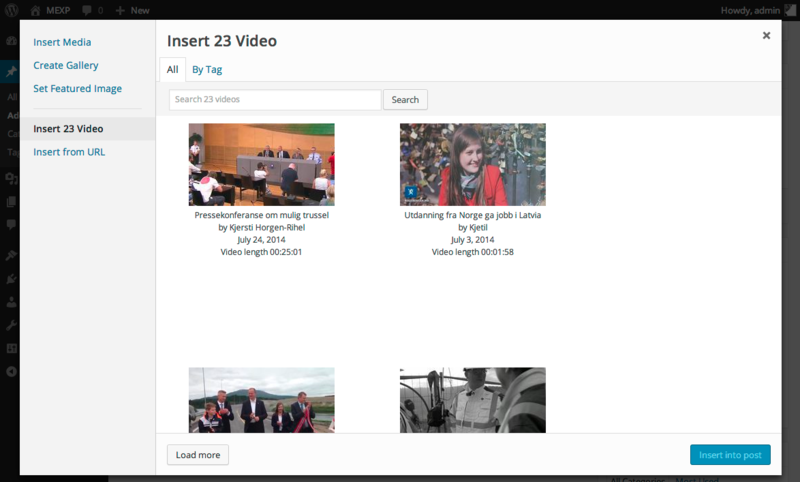 This plugin is an extension for WordPress Media Explorer plugin that adds the 23 Video service. The extension allows user to search vidoes from 23 Video by text and tag. Development of this plugin is done on GitHub. Pull requests welcome. The plugin is also available from the WordPress plugin directory. Install and activate the WordPress Media Explorer plugin. You can use the MEXP 23 settings page (Settings->23 Video) to disable the services included with Media Explorer. Upload MEXP 23 plugin to your blog's wp-content/plugins/ directory and activate. I learned a lot, and borrowed code, from MEXP Picasa and MEXP Flickr.